» City on canal recreation: No way! City on canal recreation: No way! 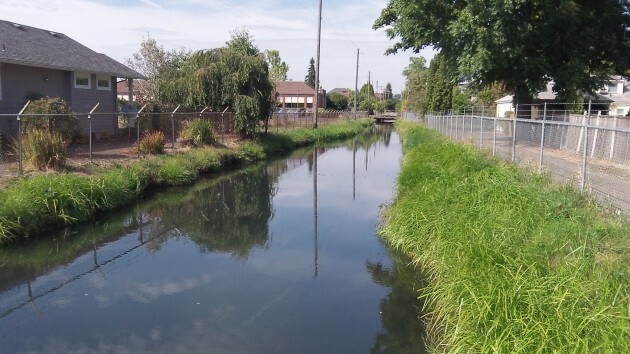 The placid surface of the Santiam Canal says nothing about the issues surrounding this historic landmark. Albany has told the federal government it has no intention of opening trails or allowing any other recreational use along the 18-mile Albany-Santiam Canal, no matter what it might say in its Town Center Plan or the downtown urban renewal program. And that is just one of the many issues — and a minor one at that — surrounding the canal and the power plant at its end. The recreation report is one of dozens of documents available on the FERC website regarding the Albany hydro license. They include the news that FERC considers the city in violation of its license — but won’t take “compliance action” — because Albany missed the annual deadlines for filing so-called “mitigation reports” for the years 2011, 2012 and 2013. Due each January of the following year, those reports outline work done on the project along with steps to protect fish. The city blamed a staff oversight for missing the deadlines, and the three reports were filed in July and August this year. Meanwhile, the city reports the turbine and generator in the Vine Street powerhouse are making money — if you disregard the costs of paying down the debt incurred to install them. For fiscal 2013-14, the plant operated for 5,114 hours over 227 days and produced 1,633,473 kilowatt hours of electricity. The operation cost $49,680 to run and generated $114,876 in revenue from selling the output to Pacific Power, for a profit of just over $65,000. Disappointing. I had always hoped there would be a compromise between the engineers and the planners on this one. The canal esplanade was one of the shining stars in George Crandall’s Town Center Plan. (CALUTS). I guess Albany doesn’t want to take advantage of its unique canal “system” and become the Venice of Oregon. If the council/ARA’s attitude is truly “No Way”, then the council/ARA should have no problem changing the CARA Plan (see The CARA Report, page 12) to remove the $3.1M earmarked for canal development (they call them “esplanades”). That $3.1M, plus much more available in The CARA Plan, would help get the new police/fire facilities built. It would also reduce the burden on taxpayers. But this is Albany politics. Who cares about taxpayers? And $3.1M in 2001 is now $4.2M after adjusting for inflation. If the council/ARA refuses to refer a substantial amendment to voters under these conditions, we’ll have indisputable proof the entire CARA process is corrupt.